Maui farm fresh flowers with free shipping !! We pride ourselves in growing and shipping the most exotic and extraordinary flowers that Maui has to offer. An excellent gift for all occasions or as a happy reminder of your trip to Hawaii. Harvested fresh daily from our farm, these large and showy blooms are packed with care and express shipped to your door. Enjoy our grower direct prices ( you need only to compare to appreciate the savings) as well as the longest vase life possible by skipping the middleman. You can expect your beautiful Hawaiian flowers to last two weeks or more and as many of you know Protea dry beautifully and can be enjoyed for many months or even years. Their lasting power is unbeatable. For the record, “No Ka Oi” translates to “ It’s the best” in Hawaiian. We honestly believe that our product is a cut above the rest. We received one of your beautiful flower baskets from our dear friends Robert & Marilyn Harris of Skokie Il. Need we say that it was one if not the most beautiful arrangement to feast our eyes on. It arrived on Friday and was in great condition. We look forward to see how they are when they go through the drying stage. It is a great gift to look forward to send to friends and family. Please let us know when you will be open to shipping to California? I’ve sent my mother your basket arrangement as a Mother’s Day gift for the past three years to her great joy and delight. She loves watching as the foliage bloom each day. Your creations make her extremely happy and, as a result, so are we! Thank you so much! I remember the first time I saw a growing protea. I couldn’tbelieve those beautiful blossoms grew on a tree! Lorie, I have enjoyed visiting with you at the Maui Craft Fair for several years, and have sent your beautiful arrangements to friends and family. And then this year I said to myself, “Wait a minute! I’m sending one to me this year.” It arrived today. Ah……. So fresh and so beautiful…..
Mahalo, for my beautiful remembrance of Maui. Yes, Maui No Ka Oi. We just got to Denver and saw the fantastic flowers you sent to our kids. I am so proud that we used you as these are just unbelievable. Mahola for sharing the Maui spirit. Thank you so much for the BEAUTIFUL flowers. I just happened to see your booth at a open market and took your card. I am so glad I did. We are all thrilled by the array. I have shared your information with others. Mahola from Washington state. Yesterday I received the most georgeous flower arrangement that I have ever seen. Art Work. Thank You and thanks to Gary for the thoughtfulness. I cannot say enough about how beautiful your flowers are. Last year when we were in Maui getting married on Valentine’s Day we sent seven arrangements to loved ones who could not join us. It was even last minute, yet you came through for us. Everyone sent us pics of the flowers they received and told us they were the most beautiful arrangement they had ever received. We could not have been happier. Our loved ones still have them on display in their homes a whole year later, as they are just as beautiful dried. We should have wrote you then saying how happy, but it was not until today when I received an arrangement from Hawaiian-Tropical-Flowers.com that prompted me to do so. Our parents who vacation at the Westin Villas in Kaanapali sent them to us for our anniversay. They had asked the concierge who to order from and that is who they suggested. Suggesting this company truly did our parents a disservice. The flowers we received were down right unacceptable and our parents spent more money on them, than on your most expensive arrangement. We have visited your display that you set up in the tents outside the Westin on market day. You would be doing the guests and concierges at the Westin and other resorts the great service of showing them your amazing flower arrangements and leaving business cards. That way when guests wish to order flowers they will be guaranteed beautiful flowers and happy with their purchase, but it is the receiver will be happiest with their choice. We will be ordering one of your gorgeous basket arrangements to mark our anniversay. Thanks for taking pride in your business! Thank you. just received my protea arrangement as you promised. Got home late Monday with a -2 degree weather, so getting my flowers remind me how our one month vacation in Maui was soooooo wonderful. Thank you again & will see you next year. sending my Mom a beautiful arrangement for her Birthday! She was sooooo Happy and they arrived in excellent condition. 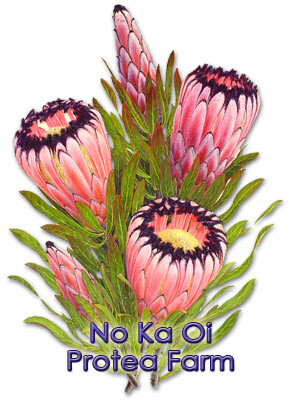 I look forward to ordering more Protea for friends & family. We have been getting your beautiful flowers baskets sent to us in Amherst, NY for the past several years and we just love them!! We have them delivered to us about a week after we come home from gorgeous Maui and they are a wonderful reminder of the special place we love. Your flower baskets are the most beautiful arrangement of flowers we’ve ever seen! We enjoy them so much while they are fresh and then after they’re dried we enjoy them sitting up on our bedroom dresser. We have sent them to numerous friends for every occasion and everyone who receives them thnk they are as spectacular as we do. Some have sent them to their family members & friends. Your service is just great too. Thank you!! Ordered the fresh twist basket arrangement for both our Mom’s for Mother’s Day. They both commented on the beauty of the flowers. Thank you for such a quality product. Look forward to our number 2 daughter receiving her bouquet next week! Thank you again. These flowers are a delight…so glorious and different than the run of the mill. The packaging and shipping is exceptional as well. What a pleasure to deal with someone who takes such pride in what they do. I’ll definitely be back for more. Truly a beautiful gift for anyone!! Thank you! !